Regardless of how America’s financial crisis pans out in the coming months or years, its safe to say that people will be cutting back big time on un-necessary expenses. Something tells me that dropping $100 at club every weekend may be the first things to go and some of the higher paying gigs will soon dry up. Even if you don’t happen to live state-side, djs around the globe might feel the crunch as our remarkably interconnected economies all start to show painful slow downs. So here are 3 essential rules to remember if your a dj and the economy goes bust. Throughout the years, time has shown that a getting smashed is a good cure for the newly broke so don’t expect people to stop drinking, they will just be doing it in different places. Clubs with cover charges and steep drink prices are going to have a harder time filling their dance floors so you will need to look elsewhere for gigs. These are the worst gig ever but ironically pay the best. In good times or bad people always get married so buy yourself a tux, 2 powered mackies, a rotating light and hit the wedding circuit. Getting these jobs is relatively easy, just prove your not an idiot and give the couple your best price. Fortunately for you, I have been through all of this once before. It was circa 2001 when all the high paying gigs in San Francisco dried up overnight. 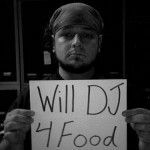 While many of my contemporaries went from billboards to UPS jobs, I managed to stay in djing full time but it required some serious strategy shifts. The main reason my gigs dried up was because I was still trying to play house music, the dominant style in San Francisco for many years. Once the economy crashed and the .com dollars poured out, people seemed to loose interest in house and rediscovered their dormant love of pop music. Ironically, it was the economy crash that got me into digital djing in the first place. A friend who was using final scratch 1 came to me and offered a simple proposition to solve the problem. “Ean, buy a laptop and I will give you all the basic hip hop tracks you need to play some simple pop gigs and get some money coming back in again.” Instead of final scratch I chose the first version of Traktor with a midi controller and the rest was history. In the coming years, even though electronic music is re-surging, expect people to be looking towards music they find familiar and comforting. Especially in smaller venues where the patrons don’t expect to hear new amazing beats but instead go to get wasted and sing along with Van Halen. Even if you do manage to get a few bookings here and there its going to be a hustle to keep your schedule filled without a regular gig. So look to get in the door at venues that can offer you something every week. Once you’ve established yourself as a go-to guy that will keep the people happy they are not likely to want to rock the boat and you can ride out the storm on a reliable pay check. Offer to keep the sound system and wiring up to date and functional. If your the guy they call when something breaks, you will get the gigs. This worked like a charm for me. Offer to help spread the word and bring more people into the bar. Show them how many friends you have on facebook! Once a djs proves he will help a bar make more money, then its a no brainer to hire him. This is the ultimate sweet deal. You get keep all the jobs for yourself and your friends and in turn they kick you back more gigs in exchange. A sure fire win-win deal.